I can’t think of a better way to describe it. Deluge after deluge and then a pause. I could escape! The tomatoes need to come out as they stopped earning their keep weeks and weeks ago. I stepped into the garden and the ground was moving. My skin was on edge. There were multi lane freeways and block parties of ants in every bed, in every path, on every post. 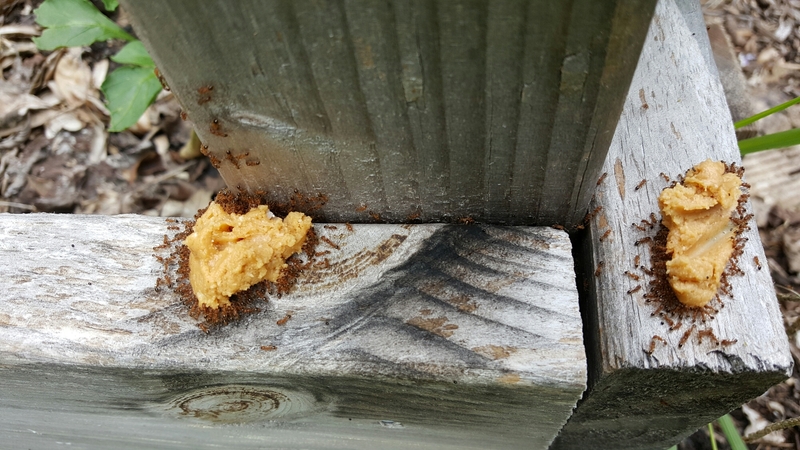 My husband had read about a new bait he’d been wanting to try: peanut butter and borax. He whipped up a batch and I set about with a spoon. This was two weeks ago now. They nearly disappeared for a week. Today was round two. I think I’ll stick to a three day cycle to try and truly banish them for at least a little while. Between the ants, mosquitos, and poison oak, outside is a little more vicious this year than most. 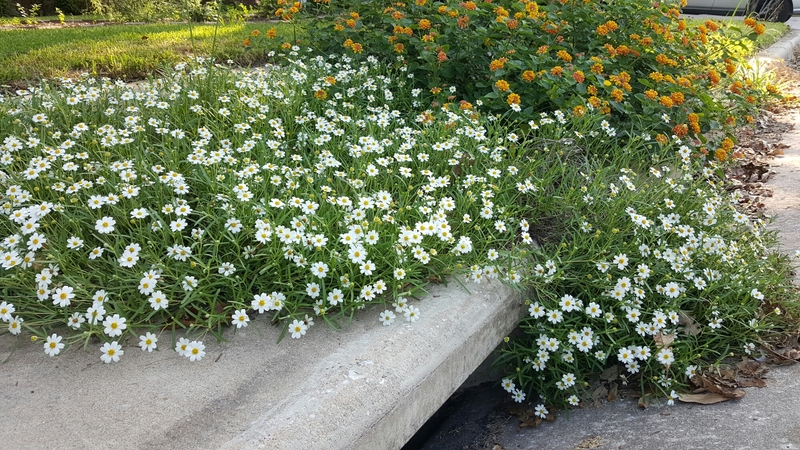 My storm drain has never looked so nice. Fall has started early this year here in Central Texas. Last year we didn’t see temperatures stay below 100 until October. We didn’t see rain until November. This year, the rain has already come. Today’s rain is a steady drizzle soaking the earth, enabling the oaks to soak up their thousands of gallons, the summer stresses to be washed from the shrubs, and the winter growth to start off strong. The rain earlier in the week came light and quick – just enough to wet the streets, muddy the gutters, and dust off the heat. Fall in Texas is different from the Pacific Northwest of my childhood in many ways. One of the ways that I still am not used to, is the behavior of the trees. Depending on variety, some trees behave as expected. They have bud break in spring, turn itchy green before summer, find their golden hues in the fall, and drop leaves to the floor with the frost. Others, behave as above with a second bud break. This tree already had its leaves, most of which were lost in the heat of the summer, but it is still driven by the need to put forth its progeny. This bud will break into a few itchy-green leaves, and one bunch of powdery seeds. Speaking of fall, does anyone know of the best way and time to prune an overgrown sage? This is a hybrid variety that is growing in maybe six inches of soil depth, with neglectful watering, and still managed to take over the sidewalk in its entirety. I had its twin in the front bed, pruned it back months ago, and it has since died for my efforts. Also noted in this photo: the strawberries survived and I’m overdue on edging the lawn. Lettuce – transplanted a few mysteries. They could be any of about eight varieties. I was set to also transplant some Amazing Cauliflower…until I started working their bed and dug straight down into a giant fire ant nest. Escaping with a single bite (and no sting) I called it done for the day. Oh, no no no, not the lotion. The mild mannered attempts at fire ant removal are a thing of the past. Today, while pulling grass from beneath the tomatoes, I felt a bite. Not at all new, as each visit to the beds awards me with anywhere from one to three bites usually, and usually on my ankles. This time, the bite was on my forearm. I looked down. My entire leather glove was black and red. My arm, nearly to my elbow, looked like it had been dipped in a teeming ooze of fire ant. Angry, and mildly terrified, I quickly ripped my fire-ant-clad glove from my hand with my other gloved hand, and dropped it to the ground. I beat my poor arm like it wasn’t attached, dislodging as many fire ants as I could with each swat. It worked. So well, in fact, that the ants had rained down and grabbed hold of my thighs, my calves, and my shoes. I beat them off as well. When I was satisfied that I had no more on me, I gingerly picked up my fallen glove and beat it soundly against a board. Ditching both gloves to be abandoned by any possible hangers-on, I went for the hose and doused my arm in cool water. Thankfully, while allergic, it’s not a life threatening allergy. I got to feel a little light headed and a fair bit of woozy for the rest of the afternoon, and this evening I’ve watched the swollen white welts turn to a swollen red arm, turn yet again into the usual little blisters the ant bites leave behind. Although this time they’re tinged with green, instead of the usual creamy yellow. I’ll try not to think about it. Within the hour I was at Green and Growing picking up a bag of organic fire ant bait. If the weather holds, the onslaught will commence at sunset tomorrow. In the meantime, I did not think to run for the camera when I saw my arm coated in crawling fire, but I did notice a previous nest had grown. Remember the failed ant trap? It’s time to show you its neighbors. They were a bit peeved that I had just watered the earth they had claimed as their own. I gave them a wide berth. Enough about the ants though, there are still some plants growing thanks to this lovely mild-for-us summer. DH found a post on Lifehacker about creating a poison-free ant trap. I’m up to three fire ant piles in and around the beds in the community garden. I’ve taken to wearing my wellies in the 100 degree heat just to keep from being bit.